Combine a love for mechanical engineering, illustration and a wild imagination and you have artist Robert L Cawein. Born in upstate New York in 1952, Cawein discovered his love of drawing. Althought his work could would not be described as retro, the 60's art influence can be clearly seen in his work. He attended school, lived and worked in historic Hudson Valley area until 2013. In the Hudson Valley Cawein explored many aspects of his talents while refining his techniques. Occasionally finding inspiration in such odd places as robotics, electrical engineering, and industrial architecture. Today we see a refined artist telling imaginative stories that morph from a line or dootle into a masterpiece. "The ideas for my work come almost completely from my imagination", said Cawein. "The germ of an idea starts off small and evolves until the painting tells me when it's done." While the color palette of a typical Cawein piece may sometimes seem to clash, they often mesh into a balanced cohesive presentation. Some of the Cawein visual conflicts create movement and an enjoyable collision of color. There is also an underlying social message that seems to sturr conversation as collectors discover their various interpretations. Now residing in Celebration Florida, Cawein has begun to expand his gallery representation throughout the state of Florida and other parts of the USA. 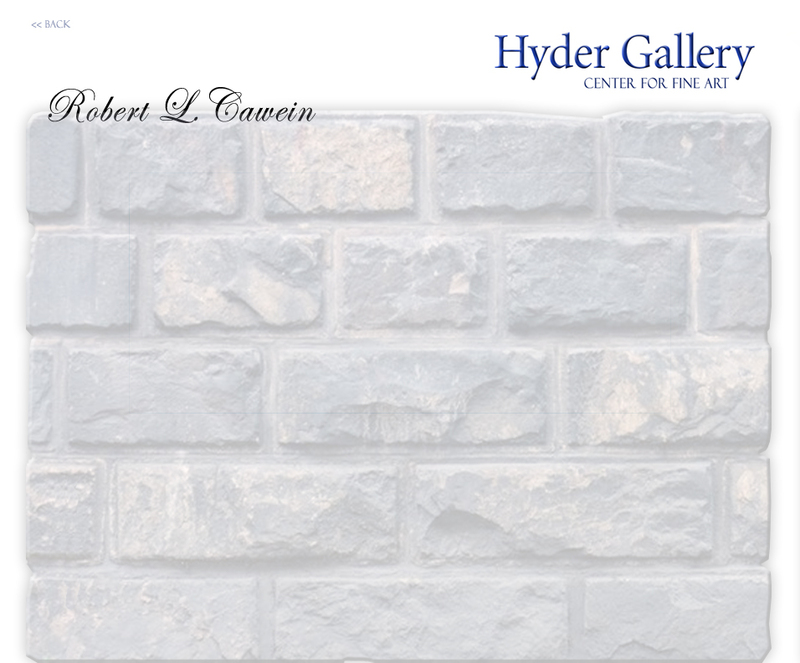 Commenting on Cawein's work, Gallery Curator Andrew Hyder said, "His use of bold and contrasting color and his attention to fine detail seem to make the viewers eyes dance. They as he would say draw the onlookers's attention and interest in for a closer look.'" Cawein's fine art has been shown in many galleries in Florida including the Arts Arena in Delray Beach, the Dekkagon Gallery in Ft. Lauderdale's Mass District, the CI&S Studios in Ft. Lauderdale and is presently being shown at the Hyder Gallery Center for Fine Art. at the Artegon in Orlando. 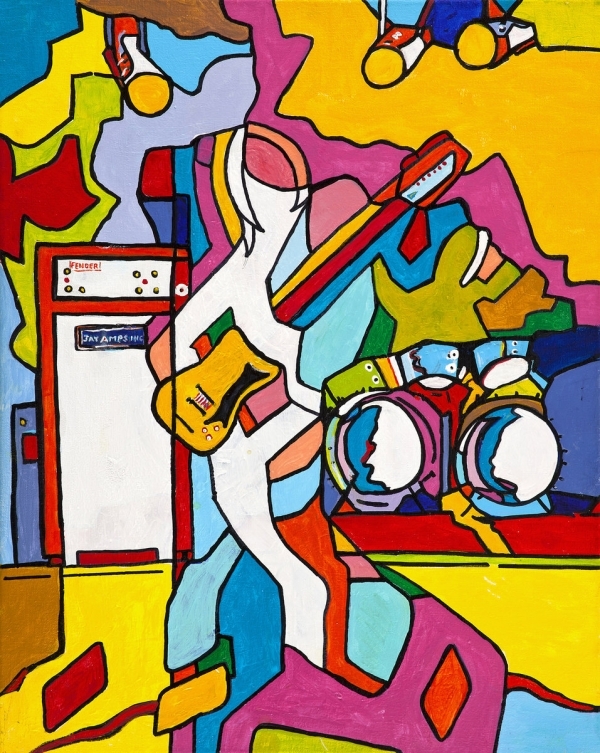 colorful take of musicians , drummer, drums , stage, guitars, concert setting. Height 20" x Width 16" x Depth 1"
Robert L. Cawein Professional Artist Combine a love for mechanical engineering, illustration and a wild imagination and you have artist Robert L Cawein. Born in upstate New York in 1952, Cawein discovered his love of drawing. Althought his work could would not be described as retro, the 60's art influence can be clearly seen in his work. He attended school, lived and worked in historic Hudson Valley area until 2013. In the Hudson Valley Cawein explored many aspects of his talents while refining his techniques. Occasionally finding inspiration in such odd places as robotics, electrical engineering, and industrial architecture. Today we see a refined artist telling imaginative stories that morph from a line or dootle into a masterpiece. "The ideas for my work come almost completely from my imagination", said Cawein. "The germ of an idea starts off small and evolves until the painting tells me when it's done." While the color palette of a typical Cawein piece may sometimes seem to clash, they often mesh into a balanced cohesive presentation. Some of the Cawein visual conflicts create movement and an enjoyable collision of color. There is also an underlying social message that seems to sturr conversation as collectors discover their various interpretations. Now residing in Celebration Florida, Cawein has begun to expand his gallery representation throughout the state of Florida and other parts of the USA. Commenting on Cawein's work, Gallery Curator Andrew Hyder said, "His use of bold and contrasting color and his attention to fine detail seem to make the viewers eyes dance. They as he would say draw the onlookers's attention and interest in for a closer look.'" Cawein's fine art has been shown in many galleries in Florida including the Arts Arena in Delray Beach, the Dekkagon Gallery in Ft. Lauderdale's Mass District, the CI&S Studios in Ft. Lauderdale and is presently being shown at the Hyder Gallery Center for Fine Art. at the Artegon in Orlando.